The history of the anarchist international from its origins in the 1860s through its height of several million members, to its later decline and current resurgence. The cooperation between Marxists and Anarchists was however to be short-lived. Marx and his fraction was in control of the secretariat of the International, and wanted to turn the International into a tool to support Social Democratic parties in Parliamentary elections. (Sounds familiar, doesn't it?) The Anarchists opposed this, and they also opposed giving more power to the secretariat; they wanted each section to have full autonomy. As we have come to expect from his more contemporary disciples, Marx turned to dirty tricks to win this fight. At a congress packed with Marx' supporters, two of the leading anarchists, Mikhail Bakunin and James Gulliame were expelled from the International on false accusations, and the secretariat was given wide powers. The Anarchists withdraw from Marx' International, and tried to set up their own. But this was in the years after the Paris Commune and a reign of counterrevolutionary terror against the Left swept Europe. Both the Marxist and anarchist Internationals, weakened by the split, died a silent death within a few years. The anarchists were driven underground in country after country. In response to the terror of the bosses, a minority in the anarchist movement launched an armed campaign and killed several kings, queens, aristocrats and senior politicians. This strategy was coined "propaganda of the deed" and was supposed to ignite the silent masses. But the result was the opposite. People got alienated by the violence, and the press got ammunition for their attack against the revolutionists: The image of the madman with a bomb under his arm was born. By the turn of the century most anarchists were convinced that a new approach was needed. They called for a return to open and public militant activity among workers. The strategy they developed was syndicalism. In 1913 there was an international syndicalist congress held in London which aimed at building stronger ties between the existing syndicalist unions and propaganda groups. Present at the congress were delegates from the FVdG (Germany), the NAS (Holland), the SAC (Sweden), the USI (Italy) and the ISEL (Britain) Observers attended from the Industrial Workers of the World (US), the CNT (Spain), the FORA (Argentina) and the CGT (France). Unfortunately the Congress' outcome was inconclusive, beyond drawing up a declaration of principles and setting up a short-lived information bureau. Within a year Europe was plunged into the First World War and communications between the syndicalists became impossible. When the war ended conditions were different. Russia had been taken out of the war by a social revolution, but the usurpation of the revolution by the Communists was not well known outside of Russia. 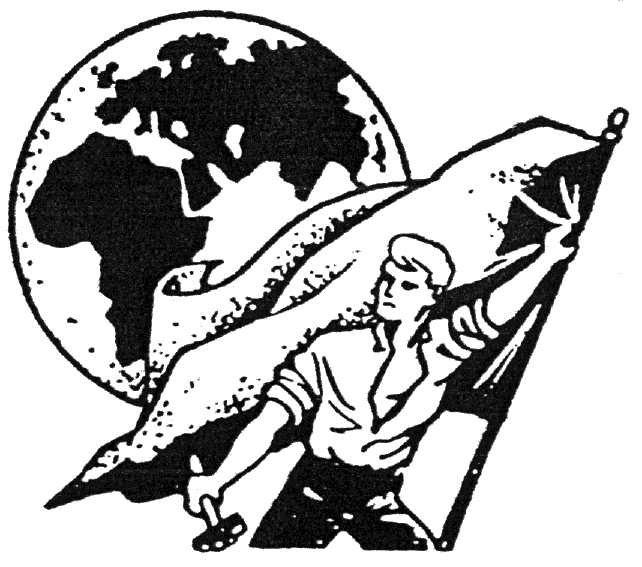 When the Communists set up the Third International, the syndicalists were invited to join their new Red International of Trade Unions. The aura and prestige of the first "successful" workers revolution caused many syndicalists to abandon their skepticism towards "proletarian dictatorship." At the RITU's first congress in Moscow, however, the syndicalist found their Russian comrades being imprisoned and shot by the new "workers" government and its secret police. Disillusioned with the Bolsheviks, they decided to form their own international organization. The founding conference of the IWA were held in Berlin in 1922. Present were the Argentine Workers Regional Organization FORA representing 200,000 members, the Industrial Workers of the World in Chile representing 20,000, the Union for Syndicalist Propaganda in Denmark with 600, the Free Workers Union of Germany (FAUD) with 120,000, National Workers Secretariat of the Netherlands representing 22,500, the Italian Syndicalist Union with 500,000, the General Confederation of Workers in Portugal with 150,000, the Swedish Workers Central Organization SAC with 32,000, the Committee for the Defense of Revolutionary Syndicalism in France [a breakaway from the CGT] with 100,000, the Federation du Combattant from Paris representing 32,000. The Spanish CNT was unable to send delegates due to the fierce class struggle being waged in their country under the dictatorship of Primo de Rivera. They did, however, join the following year. During the 1920s the IWA expanded. More unions and propaganda groups entered into dialogue with the IWA secretariat. They were from Mexico, Uruguay, Bulgaria, Poland, Japan, Australia, South Africa, Paraguay and North Africa. Syndicalist unions outside the IWA also existed in many countries such as the Brazilian Workers Regional Organization and the Industrial Workers of the World in the USA (which soon spread to Canada, Sweden, Australia, South Africa, and Britain). In 1936 the Popular Front, a coalition of communists, social democrats and liberals, won the general elections in Spain. The new government that followed only introduced minor reforms, but this was still to much for the Spanish ruling class. In July 1936 the fascists, led by general Franco, attempted a coup. The government in Madrid was paralyzed, and the fascist would have won an easy victory had it not been for the anarcho-syndicalists workers of the CNT. In Barcelona and other cities, the workers took to the streets, surrounded the army barracks and took on the army with the few and outdated weapons they could get hold of. Thus, the fascists coup was halted, and thus began the Spanish Revolution and Civil War of 1936-39. In Catalonia (the north-eastern part of Spain) the anarchists were now in full control. Most of the factory owners had fled, so the workers took over the factories and started running them themselves. Neighborhood committees was established to distribute food, and workers militias was organised and sent to the areas that the fascists controlled. On the countryside, the farmers collectivised the land that up to now had belonged to a few rich landowners. Free communes were set up, and the president of Catolonia offered to resign in favor of the CNT. But the Popular Front was still in power in Madrid, and Franco's fascists controlled almost half the country. The CNT decided that anti-fascist unity was more important than spreading the revolution. They also knew they needed help from Russia and the western democracies to beat the fascists, who was backed by Hitler and Mussolini. Alas they struck a deal with the government in Madrid. The CNT joined first the Catalonian government and then the federal, and Garcia Oliver became history's first (and hopefully last) anarchist Minister of Justice. The alliance with the Popular Front proved to be a fatal mistake. The western democracies refused to help the republican side, fearing a workers revolution more than they disliked the fascists. Russia sent some arms, but made sure that they went to their communist allies. The anarchist militias was refused weapons and finally forced to merge with the Popular Army. The collectivised factories and farms got broken up, and the Communists were already setting up secret prisons. The last resistance of the anarchists happened in May 1937 as the police tried to take over the CNT-controlled telephone exchange. The street fighting lasted for days, but even now the CNT leadership backed down. The civil war stretched out for two more years, but the revolution was already dead. By the end of WWII, the European syndicalist movement and the IWA was almost destroyed. The CNT was now an exile organisation. The Italian USI, the largest syndicalist union in the world, despite fierce resistance had been crushed by the Mussolini dictatorship. In Germany there had been mass trials of members of the FAUD, many of whom didn't survive the concentration camps. The Polish syndicalist union with 130,000 workers, the ZZZ, had been on the verge of applying for membership of the IWA when it was crushed by the Nazi invasion. But, as with syndicalists elsewhere, they did not go down without a fight. The Polish ZZZ along with the Polish Syndicalist Association took up arms against the Nazis and in 1944 even managed to publish a paper called Syndicalista. In 1938, despite their country being under the Salazar dictatorship since the 1920s, the Portuguese CGT could still claim 50,000 members in their now completely illegal and underground union, but the union could not survive forever. Similar fates was waiting for the Dutch NSV, the French CGTSR and many other unions in Eastern Europe and Latin America. In 1951 the IWA held their first post-war congress in Toulouse. This time they were a much smaller organisation than the great movement which existed at their first congress. Delegates attended, though mostly representing very small organizations, from Cuba, Argentina, Spain, Sweden, France, Italy, Germany, the Netherlands, Austria, Denmark, Norway, Britain, Bulgaria and Portugal. A message of support was received from Uruguay. Things were not looking good for the reemergence of anarcho-syndicalism. In Eastern Europe the new Stalinist regimes banned all strikes and free trade unions. As usual, the anarchists were the first to be sent to the prison camps. In the West massive subsidies from the US and the Catholic church went to tame unions controlled by Christian Democrats and Social Democrats. Meanwhile Russia did the same for their allies who controlled the French CGT, the Italian CGIL and others. The IWA, in its weakened state couldn't compete for influence. In the late 1950s the Swedish SAC withdrew from the IWA. There was now not a single functioning union in its ranks. It staggered on as a collection of small propaganda groups and exile organisations like the Spanish and Bulgarian CNTs. Some wondered if it would live much longer. Things began to turn around for the IWA in the late 1960's. The near revolution in France in 1968, the "hot autumn" of 1969 in Italy, the hundreds of other class battles worldwide and the general radicalization of a new generation helped the IWA and its various affiliates. Then suddenly in 1975 Franco died and his regime fell. The CNT blossomed. Within a matter of months its membership leaped from a few hundred activists to over 200,000. (Later a reformist wing spilt out, and the CNT membership today probably does not reach 10,000.) The growth of the CNT put syndicalism back on the anarchist agenda; old sections has been revoked, and new ones has been started. Today the IWA has three Sections which function as unions (in Italy, France and Spain) and propaganda and solidarity groups in 15 other countries. At its recent congress groups from seven countries was adopted as new sections, among them Russia and Nigeria. There were also talks with the Garment Workers Federation of Bangladesh (who claim 20,000 members) whose entry was rejected. In a more negative development parts of the French and Italian Sections have now been excluded from the International. Outside the IWA are also other syndicalist unions and organisations like the 10,000 strong SAC in Sweden, the IWW (who regularly discusses whether to join the IWA or not, but can't make up its mind), the OVB in the Netherlands, the Spanish CGT (the spilt from the CNT), the CRT in Switzerland, and others. The IWA believes that the downfall of "communism" (state capitalism) has opened up new possibilities for the libertarian left. New syndicalist and anarchist groups are now being organized in nearly every former Stalinist country. But more important than this, the various Stalinist/Maoist/Leninist/Trotskyist sects are now thoroughly discredited. This has meant a general shift to the right in everyday politics, but it also means that radical people in search for an alternative will be looking their way. This article is based on a series of other articles or pamphlets written by different authors over the years. You might want to add a citation of the Wikipedia article on there an all, given that the author lifted a fair chunk direct . A useful and honest summary but the reference specifically to the IWA's ''current resurgence'' perhaps lacks a critical perspective in comparing the current size, political make-up and influence of today's IWA operating in the changed conditions of modern global capitalism to that of it's forerunners in very different circumstances?